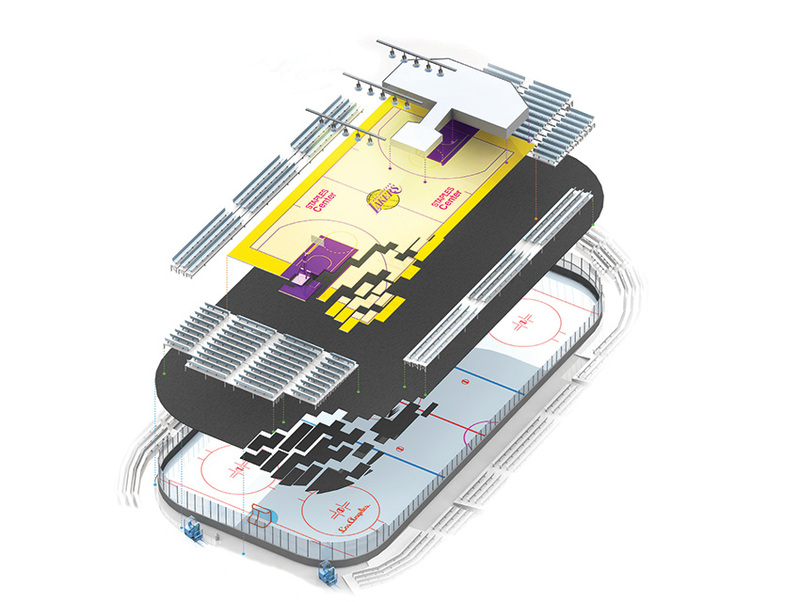 Staples Center is a feat of engineering: No other arena has two NBA teams and an NHL team sharing the same floor space. Since opening in 1999, the $400 million facility has hosted more than 4 million guests per year for 250 different kinds of events, from boxing matches to Beyoncé—sometimes in a single weekend. Here’s the full-court press. The Staples floor is 18,800 square feet and has eight levels. The base is cement and covered with ice from October through April. When changing from a hockey match to a basketball game or concert, the pit crew lays 520 sheets of polyurethane-coated plywood over the ice, which insulates against the cold and condensation. The rest of the levels come together like a jigsaw puzzle. To go from a Clippers to a Lakers game requires more than switching logos. A new set of 2,000-pound baskets is wheeled in, part of a process that takes less than an hour. The most important pieces of equipment are the forklifts. They move everything from the lower-level seat sections to the hardwood boards that form the basketball court. There are 160 metal halide bulbs, custom designed for each event. No two basketball games are alike: The Clippers use the traditional house lights, while the Lakers’ luminescence re-creates the effect at the Forum, their former home. The stage for most concerts is 120 feet wide, 60 feet deep, and 6 feet high. Prepping for the Grammys is the most difficult because of the number of performers and the quick turnarounds. There are upper and lower bowls, with 160 luxury suites in between. General admission for Lakers games is $170—the steepest in basketball. Lady Gaga tickets top that, at $440. Seven miles of steel pipe are embedded beneath the base, along with a pump filled with glycol, a liquid coolant that keeps the ice frozen and puck ready.